Dred Scott v. Stanford 60 U.S. 393 (1857) was a United States Supreme Court landmark decision. In 1857 the court ruled that African Americans, whether free or slaves, were not citizens of the United States. Because they were not citizens they could not sue in a Federal court. Dred Scott sued in federal court. He claimed he was free because he lived in free territory. He lost his case in a ruling that has been universally condemned as the Supreme Court's worst decision. Dr. John Emerson was a surgeon serving in the U.S. Army. In 1833 he purchased Dred Scott, a slave in Missouri. The same year he moved to Illinois taking Scott with him. Emerson was sent to a fort in the Wisconsin Territory. Scott, his slave, went with him. While living in the Wisconsin territory (now Minnesota) Scott met and married Harriet Robinson. She was owned by a justice of the peace. After marrying Scott, Emerson became her owner as well. Emerson returned to Missouri taking his slaves with him. In 1843 Emerson died in Missouri. Scott and his family were left to Emerson's wife, Eliza Sanford. In 1846 Scott sued for his freedom in court. 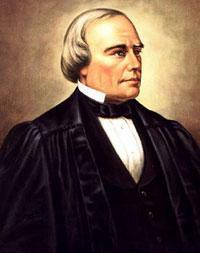 Helped by Abolitionist lawyers, he claimed that he was free because he had lived in free states for a long time. The defense claimed that Dr. Emerson was forced to move to the Wisconsin territory because he served with the United States Army. He should be able to keep his property. The presiding judge, Roger B. Taney, decided that Scott was not free and he did not have a right to sue. Furthermore, he stated that Congress could not make laws prohibiting slavery in United States territories. This was the majority opinion with seven out of nine Justices agreeing. The opinion of the dissenting justices was that, at the time the Constitution was ratified, African Americans were already considered citizens in several states. The ruling was a major setback to the anti-slavery movement. The Republicans condemned the ruling. In effect, it allowed slavery in the northern states. It became a central issue in slavery debates in the US. In 1868 the Fourteenth Amendment overturned the Dred Scott decision. It gave all persons born or naturalized in the United States citizenship regardless of their color. Soon after the court decision of 1857 Eliza Sanford sold Scott and his family to Taylor Blow. Blow (one of Scott's previous owners) then granted Scott and his family their freedom. Scott died a free man on September 17, 1858. He did not live long enough to see African Americans become United States citizens. Chisholm v. Georgia, which was overturned by passage of the Eleventh Amendment. 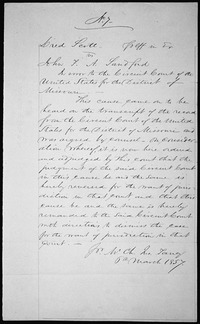 Pollock v. Farmers' Loan & Trust Co., which was overturned by passage of the Sixteenth Amendment. Oregon v. Mitchell, which was reversed by the Twenty-sixth Amendment. Minor v. Happersett, which was indirectly overturned by the Nineteenth Amendment. In 1875, Virginia Minor, in trying to gain the right to vote for women, argued the Fourteenth Amendment gave citizens the right to vote. The Court said it did not. The passage of the Nineteenth Amendment, 45 years later, gave women the right to vote. However, Minor v. Happersett was still cited as case law into the 1960s in other right to vote issues. Justice John McLean was the senior justice of the two dissenting opinions. Justice Curtis was the junior dissenting justice. Dred Scott v. Sandford Facts for Kids. Kiddle Encyclopedia.